For one week, from November 23rd to 30th, 2012, both StitchBuddy products are offered with a 70% discount: Get StitchBuddy for your Mac (USD 14.99), or for your iPad (USD 8.99), and enjoy your embroideries like never before. Be sure to place your order in the mentioned timeframe to entitle to this rebate. 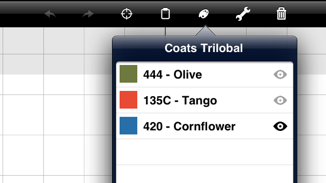 As I announced on Facebook yesterday, StitchBuddy v2.4.5 is just released for both, Mac and iPad as a free update. In addition to some minor enhancements the new version is able to read Janome JPX design files, and adds WonderFil Splendor to the supported thread charts. Customers asked for both features, and I'm happy I could provide them. Unfortunately the support for JPX files is not as smooth as I wanted it to be: As a matter of fact the file extension ".jpx" is already reserved by another file type: JPEG 2000, a graphic file, so Janome made a bad decision using the same extension for their embroidery designs. Implications for StitchBuddy can be found on the related support pages (Mac, iOS). Feel free to download the new version for your Mac here, or use the App Store update function on your iPad. I'm currently looking into Janome's JPX embroidery format: extracting stitches / threads seems quite easy, but I'm unsure about the image background which is used to layer JPX designs with graphics. Unfortunately I don't have any Janome software and therefore no experiences with this feature on my own. @Horizon users: How are you using the new file format? Feel free to comment on StitchBuddy's Facebook page. Update StitchBuddy for free on both, your Mac and your iPad... either in the App Store or from the download page. Today I've added a new feature to StitchBuddy HD, although it still needs some testing: In the color list a thread can be selected to be highlighted, leaving the other threads gray-scaled. This way it is much easier to identify where a specific thread is used, e. g. before changing its color. Today I enlisted in Apple's Mac Developer program to support the "Gatekeeper" security feature in OS X 10.8 "Mountain Lion": Unfortunately my iOS certificate was not sufficient to sign StitchBuddy for Mac. I just uploaded a very, very, very minor release of the OS X app and its plugins: StitchBuddy v2.4.3 is now completely code-signed to comply with Gatekeeper of OS X 10.8 "Mountain Lion". In addition I tested all functions of StitchBuddy and the Quick Look / Spotlight plugins with the upcoming operating system, and everything is working flawless. I should have known better then to look into StitchBuddy HD's App Store reviews, as this system has two major shortcomings: First of all it does not allow developers to respond to comments, neither in the store nor directly by mail. Additionally people are more willing to leave reviews if they are not satisfied with a product, often leading to a mismatch between published reviews and the perception of all users. But StitchBuddy is barely two months released, so I'm still monitoring the reviews closely. But that's another story and not the main reason for this blog entry. Users of iOS devices are used to $0.99 apps … me too … but many of these apps are either limited, or aiming at huge market shares with literally thousands of users. StitchBuddy HD offers functions on the iPad that are often priced three or four times more on PCs or Macs, and it targets a rather small user group. From an economical standpoint its development is just disastrous, but I don't mind: When I thought about publishing StitchBuddy HD, I decided for a price that is affordable and reasonable, but still reflects the hundreds of hours of work behind. Additionally, with Apple's share (there is no official way around the App Store) and taxes, a developer receives only about 50% of an app's price as earnings. StitchBuddy HD's description in the App Store lists all features, and I provide a demo video showing its handling. Don't hesitate to send me a mail if you have any questions while thinking about making a purchase. And if you are using StitchBuddy HD, please leave a fair rating / review in the App Store. Tonight, after one week "Waiting for review" a minor bugfix of StitchBuddy HD was approved by Apple. It addresses some issues that were identified by a customer using specific PES files. So far unknown color codes were included in these files, and selecting these caused the app to crash. Thanks for your help, Di! Performance improvements for Retina displays. Enhanced PES support (additional color codes). Fixed: Corrupted grid at some zoom levels on Retina displays. Fixed: Crashes caused by unknown thread colors. The Mac application StitchBuddy benefits from some of these changes as well, so a minor update to version v2.4.1 was released today. The last months it was pretty quiet, wasn't it? Actually I was really busy working on a new version of StitchBuddy. This time I didn't add some feature, but … a new device: StitchBuddy runs on iPad! A tablet is not a powerful computer, for sure, and modifying large designs might be beyond its capabilities. Personally I don't want to digitize or change single stitches on a tablet, but what about all these purchased designs you might want to tweak a little? Wouldn't it be great to look at them on the go or sitting on the couch? To change some colors, combine some designs, and share the result by email? I think it would be cool, and now you can: StitchBuddy HD is available on the App Store, and can be purchased for only USD 29.99. Learn more about its features in this video. StitchBuddy HD uses the same core functions as the Mac app, which was updated, too: With the new version (v2.4) you can easier identify single stitches even if 3D effects are turned off.